Critter calling cards on our stoop. T.S. Eliot was dead wrong. April is not the cruelest month. March is. One day it’s warm and lovely, the next, snow is falling and the ground is white, again. For those of us waiting to build, to plant, to get a jump on the season… it’s agony. Those nice days—just teasers—don’t let them fool you into starting your seeds early. It’s March, the season of the lions and the lambs. My years in Northern California, where daffodils come up in February and (if you’re lucky) March will deliver a seasonal, finale rainstorm, have confused me as to the truly transitional nature of March. March, in Northern Michigan, is here to teach patience. I’m trying to find transitional, spring-readiness things to do. I’ve hung my laundry on the line in the snow. (Yes, it works.) We’ve assembled, primed and painted the bee boxes. I’m pulling nails out of some recycled flooring we bought on craigslist. It’s a time of enforced waiting. Today we’ve seen light snow and temperatures in the teens, again. By midday, we may see twenties—what’s spring-like about that? Those stellar 40s and 50s of several weeks back, spoiled us. Now, temperatures in the 20s and 30s feel cold. We’d spent February hiking in single digits and teens, without complaint but now, we turn up our collars on much nicer days. There are things that need this on-again-off-again season. Warm days and cold nights wake up the trees. Sap begins to run. 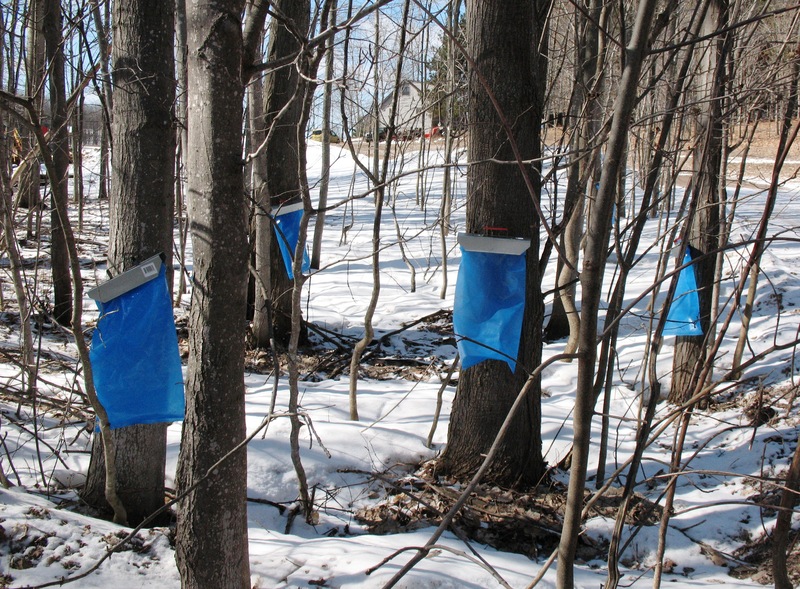 March is the sugaring season. Without the stuttering warm-cold cycles, the sap production would go straight to manufacturing leaves—and we’d have no maple syrup. I’m a little in awe of the sugaring process. Who thought that up, all those eons ago? The whole thing is an exercise in patience; collecting the sap, literally, drop by drop; boiling it down, for syrup it takes forty gallons of sap to get one gallon of syrup; and bottling it up. Sugar-maple candy boils down even further, and then gets instantly crystalized, ladled into the snow. Around here, it’s mostly the old timers who still tap the trees. Our neighbors do, using new-fangled drip collection bags, (if you’re patient, you can watch the steady dripping that turns the season.) We’ve talked about it; we certainly have the maples. It goes into our ‘maybe someday’ list. The critters are out. We’re in a walk-out, basement apartment, so we see them almost eye-to-eye as they wander about, unfettered by deep snow. There’s a herd of deer who happen by everyday at dusk. Just before the deer show up, there’s a small parade of turkeys. The bunnies come out just as the last light fades. 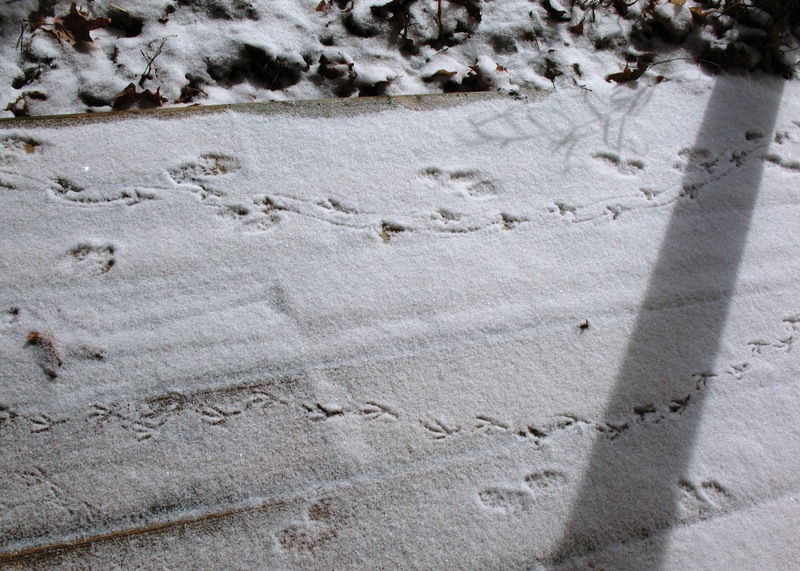 If we miss them, we can take attendance by the tracks left in the thin spring snow. Two days ago, the robins arrived. I was sitting by the window and suddenly the yard was full of them. To the impatient among us, they are a sure sign of Spring. Hmmm, we have started all our plants. Yeah, but you have a greenhouse–more room to work with them, multiple repotting possible…. You make it sound so peaceful. I’ve heard that maple syrup collection is difficult. It sure sounds like it. I make mine with water, sugar, and fake maple syrup flavoring. Not as good, but does the job. It’s not the collecting that’s difficult; it’s the cooking down. It foams over easily and the more syrupy it gets, the higher the danger of bad burns. We figure if we do it, it’ll be an outdoor operation. We’ll burn pine for heat (we have a lot of excess pine and we won’t burn it indoors.) But with acres of maples, we’d be goofy if we didn’t at least consider it. Nearly 80 last week, it’s 21 this morning as I type this. My to-do list grows ever longer. But instead of enjoying a few more quiet, unhurried days, I keep fretting over the weather and longing for spring. But the long busy warm days are coming. The robins know that. Yeah, I need to work on that enjoying the lull, too. This year it seems like we just went from fall to spring in Northern California. But I remember the years when it felt a little bit like winter, and how you can get disoriented about what spring is like here versus most other places. We need is a good El Niño — two or three of them!!!! The weather pundits seem to think that the overall Pacific warming is interfering with the regular El Niño oscillation. I don’t know how far north you are, but in Two Rock (outside of Petaluma) we used to have some pretty wintery weather. There, we couldn’t plant in spring until May 10, because of frost danger. (Strangely, it’s about the same “frost free” planting date that we have here!) Two Rock was a full two to three weeks later than Petaluma itself–only nine miles away. California seems to be the master of the microclimate. Our seven day forecast still has a chance of snow on Saturday–I’ll settle into spring when there’s no more snow on the horizon. At least you have water!!! !